From the creators of 'Dog Food SECRETS™', the Internet's #1 best selling book on dog nutrition, comes this dog-saving guide. Discover how it can save the life of your dog..
"Create a complete list of the very WORST dog food ingredients used today, including a full explanation of what it is and why its dangerous." To everyone's surprise, our researcher came back with a document with no less than a whopping 68 unwanted ingredients still used in commercial dog food! Get this FREE report and I'll tell you 5 of the WORST ones right now! 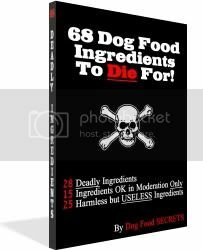 With my team, I created a new 70-page book titled..
"68 Dog Food Ingredients to Die For!" Anyone using commercial dog food should have this information in their library. Take a look at what's inside..
in this book are deadly! 28 Deadly Ingredients - avoid foods containing these. Known to cause disease or still simply... 'effects unknown'. 15 ingredients OK in moderation only - these should be low on the ingredients list. Too much and your dog becomes ill.
25 harmless BUT useless ingredients - used so dog food companies can fill your dog's belly cheaply. You end up paying for nothing and your dog is full but not nourished! I'll even go a step further..
"A Very Useful Bonus For You.."
I want you to use '68 Dog Food Ingredients' to the benefit of your dog.... so it has to be useful, that makes sense. Unless your brain is much larger than mine, there is no way you're going to remember all 68 of these ingredients. If you're like me, you don't want to write them all down or take a 70-page book to the supermarket. So now all you need do is take your easy to read, quick reference guide to the supermarket with you..
... and the bottom line is your dog stays healthier and lives longer because you've become an informed and clever shopper. "I'd be crazy to pass this up, let me order now"
But, right here right now, on this page only and not to be repeated..
"This is really a no-brainer.. take me to the secure order page"
"Look at it This Way.."
Our book is about half the price or less than the first 4 items in that list..
Our book is the only one with the power to save your dog's life, no exaggeration.. I don't say that lightly, we fully expect dog lives will be saved because of dog owners using our information to make better purchasing and feeding decisions. If you're still not sure, don't worry, we know how hard it is to trust a website enough to make a purchase online, we've all been there. to Answer Your Concerns That We Could Come Up With"
AND still let you keep everything for FREE, just for giving us a try!" AND you have a full 8-weeks to decide.. If at anytime you are not satisfied, we'll refund every cent and you keep the book & quick-reference table! If you decide you don't like our materials, we'll return 100% of your money and you keep everything! Even, if for no reason at all, you decide its not what you want, we'll give your money back and you still get to keep your copy of our books FREE! PS. You receive '68 Dog Food Ingredients to Die For!' 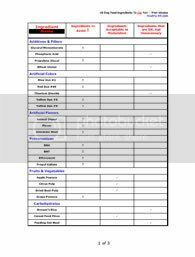 & the bonus quick reference table. PPS. Nearly every commercial dog food brand contains many of these ingredients, you'll be surprised how wide spread their use is. PPPS. If you don't like it, I'll refund your money and let you keep it and the bonus quick reference chart anyway! You can't beat that. PPPPS. These materials are downloadable only, because we love trees and prefer not to be responsible for tree logging when its not necessary.